Not surprisingly, the Gateway Pacific coal terminal was the topic of some of the questions at this morning’s Small City Mayors forum in Ferndale. 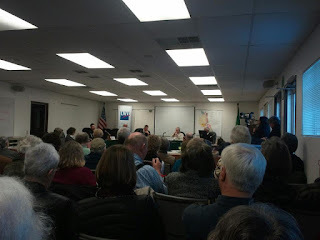 The League of Women Voters of Bellingham/Whatcom County sponsored the forum. Many thanks to the League for this contribution to civic discussion in our community. The forum raised more questions than it answered, I think, which is one of the purposes of discussions. Here are a couple of questions that I wish I could have asked. The small city mayors are already on record as unequivocally, unquestioningly supporting the coal terminal. They have established that they have no interest in “the process” as you and I might envision it: an objective approach to gathering the information needed to evaluate community, environmental, and economic impacts, thereby ensuring that coal terminal benefits are weighed knowledgeably against impacts. These statements demonstrate not one shred, not one iota, of intent to pay any attention to the “process.” The small city mayors have already made their decision. Process is for everyone else, apparently. In fact, as David Stalheim pointed out during today’s forum, some of the small city mayors subverted “the process” by walking to the head of the line at the Ferndale scoping meeting. Line-sitters paid by the project applicant held spots for VIPs, while citizens who had followed the “process” by showing up early and waiting in line for hours wound up with no opportunity to speak. One of the more heartfelt and moving moments of the meeting came from Blaine’s mayor. In response to a question about each mayor’s major concerns, Mayor Robinson said that his major concern was delays caused by trains. “Trains slowing down affects our city very dramatically,” he observed. For example, school buses arrive at school late when they have to wait at rail crossings, and children who depend on school breakfasts have to go without breakfast when the buses are late. Trains also delay Blaine’s emergency vehicles. Mayor Robinson vividly described his own wife’s experience. She had required an ambulance, and the local ambulance was not able to provide the drugs that she needed. An ambulance was called from Bellingham – and it had to wait 20 minutes for a train to pass. You could be excused for expecting that the mayors would show some human reaction to this story. You might think, for example, that at least a few of the mayors would show concern for the fact that the Gateway Pacific project would add 18 ADDITIONAL coal trains per day, each 1.6 miles long. You might assume that this concern would lead to a broader discussion, in light of the fact that their constituents, maybe even their own family members, might. . .die from the impacts. If BNSF shouldn’t be saddled with so much undue burden, who will pay for those improvements? Anyone? Will you, the small city mayors, pay for the needed improvements? Or is it OK with you simply to impose this burden on your constituents, who will have to live (or die) with the delays? Small city mayors, is it “equitable” to impose the harms that 18 more trains will create– the kids who don’t get breakfasts, the spouses and children and parents and siblings who don’t get emergency services in time – on communities between here and Wyoming, just for your “own needs”? And – I might add -- don't tell me to wait for "the process." Not when you don't play by the same rules. Jean Melious is the Secretary of the Board of Directors for RE Sources for Sustainable Communities. More of her writing can be found on her co-authored blog, Get Whatcom Planning. I don't know about this. The current one is garbage, but it looks decent. This one, it is so much well. This is great information for individuals who are looking for areas for their BMW automobiles. Save BMW vehicles are usually one of the simple creates to discover. This is because of their reputation and the capability to get top money type areas and damaged automobiles. BMW lovers or individuals who are into repairing can discover many recyclable areas from a Salvage bmw car.